may be an uneven distribution of loads to the strands; a condition that will significantly shorten the life of the rope. The two widely accepted methods of applying seizing are illustrated in Figures 25A and 25B. The seizing itself should be soft, or annealed wire or strand. Seizing wire diameter and the length of the seize will depend on the diameter of the wire rope. But the length of the seizing should never be less than the diameter of the rope being seized. 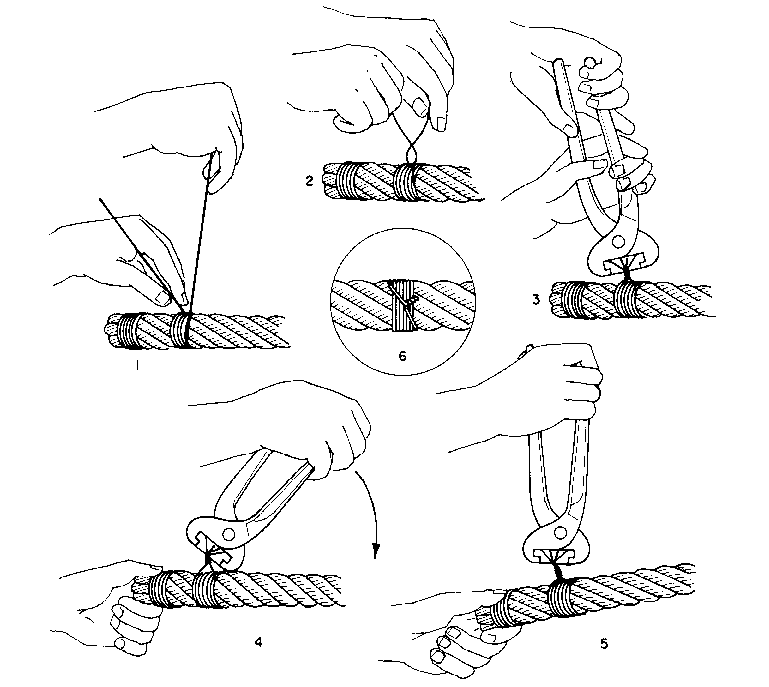 Normally, for preformed ropes, one seizing on each side of the cut is sufficient. But for ropes that are not preformed or rotation resistant ropes, a minimum of two seizings on each side is recommended; and these should be spaced six rope diameters apart (Fig. 26). Table 4 lists suggested seizing wire diameters for use with a range of wire rope diameters. Figure 25A. Method A: The procedure illustrated at right is the second of the two (A and B) accepted methods for placing seizing on wire rope. Figure 25B. Method B: Lay one end of the seizing wire in the groove between two strands; wrap the other end tightly in a close helix over a position of the groove using a seizing iron (a round bar 1/2″ to 5/8″ diameter x 19″ long ) as shown above. 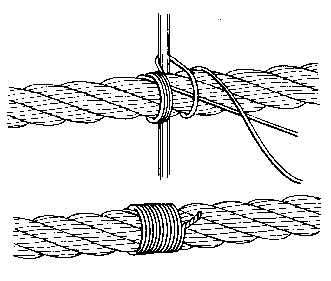 Both ends of the seizing wire should be twisted together tightly, and the finished appearance as shown below. Seizing widths should not be less than the rope diameter. *Length of the seizing should not be less than the rope diameter. **The diameter of seizing wire for elevator ropes is usually somewhat smaller than that shown in this table. Consult the wire rope manufacturer for specific size recommendations. Soft annealed seizing strand of an appropriate size may also be used.